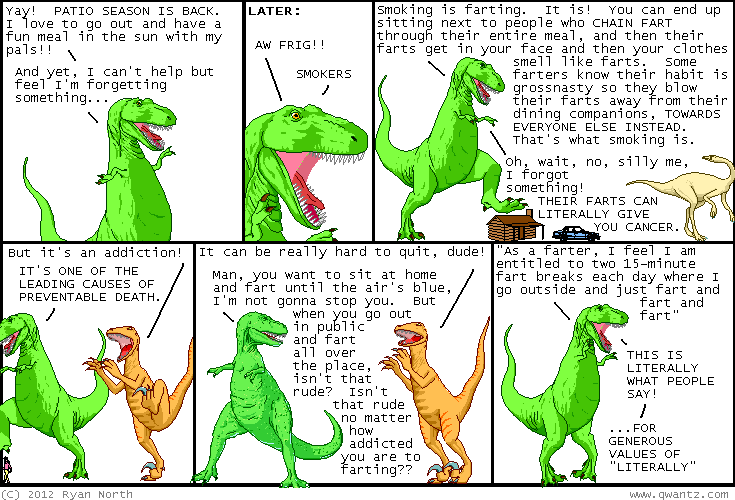 Farters | Random moosages as I see fit. I’m back in the office…finally. It’s nice to be back home, but trying to get ready to go into the office was really difficult last night. I hadn’t done it in a month. What do I normally bring with me to the office? Why can’t I remember? Anyway, one of the things FSB had told me before he ditched us in WI, is that by the time I got back to CA, he would have already quit smoking (again) because I was giving him a hard time about it in WI. Welp…he hasn’t. I caught him at it. He looked guilty when he told me he hadn’t quit yet. So, as an encouragement, I sent him this comic. Image links to original comic.